Hong Kong could cash in on a green finance frenzy. This is no eco-warrior fantasy: the United Nations reckons the world needs $90 trillion to fund sustainable development over the next 15 years. China estimates its environmental policy will cost 2 trillion yuan ($305 billion) a year. Many countries – including the People’s Republic – are likely to raise funds using green bonds, which earmark proceeds for sustainable projects. China accounts for around a fifth of the $29 billion of green bonds issued in the world so far this year. Yet the fledgling asset class remains fuzzy. Issuers can choose whether or not to use voluntary guidelines; even the definition of “green” is flexible. More importantly, there’s no sanction if issuers renege on their promise to make sustainable investments. Hong Kong could help whip the immature market into shape. The Special Administrative Region has a privileged relationship with mainland China, yet its financial markets are better regulated and more transparent. Hong Kong could raise the standard for green bonds with clear rules, and compulsory disclosure of financials and use of proceeds. The territory could match issuers with large international investors in the same way it has done with equities and bonds denominated in renminbi. 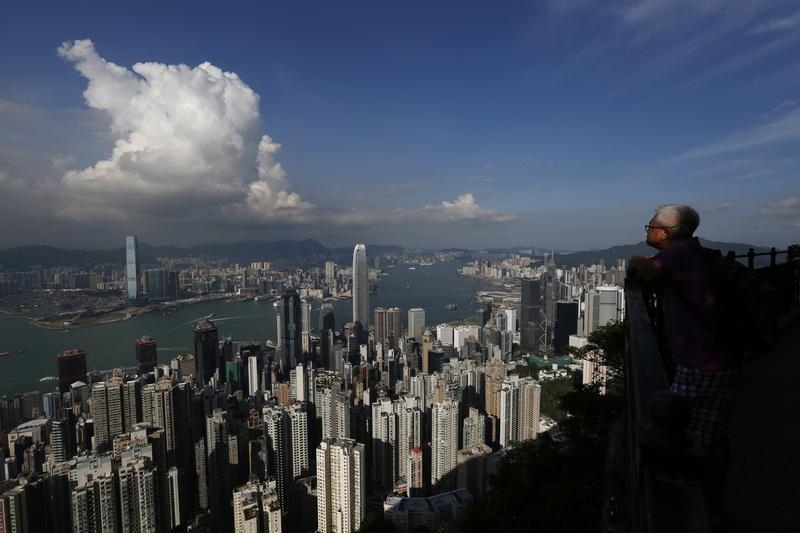 Yet for all its finance flair, Hong Kong can be slow on the uptake. Sustainability remains an afterthought for many of the territory’s money managers – an outdated view in the wake of the recent international climate deal in Paris, which prompted institutions with $24 trillion under management to commit to responsible investment. Rival financial centres have already stolen a march. Chinese carmaker Geely chose Singapore for a $400 million bond; while Agricultural Bank of China went to London. Even Hong Kong-based utility CLP issued a green bond in India. Wind turbine maker Xinjiang Goldwind’s $300 million issue remains Hong Kong’s only green security to date. So Hong Kong needs to catch up. The Financial Services Development Council, a government advisory group, says authorities could kick-start demand by issuing benchmark bonds. They did something similar when trying to develop a market for Islamic finance. Even though it is a late starter, the opportunity to set the standard for China’s green bond market is Hong Kong’s to lose. Hong Kong’s Financial Services Development Council released its report “Hong Kong as a Regional Green Finance Hub” on May 24. The report argues that the city’s authorities should make greater efforts to encourage environmental finance, such as green bonds. Global green bond issuance in 2016 had reached $28.7 billion by early June, versus $41.8 billion for the whole of 2015, according to the Climate Bonds Initiative. Chinese issuers account for around a fifth of issuances so far this year, versus around 3 percent in 2015, based on data from HSBC. Xinjiang Goldwind, which makes wind turbines, became the first company to issue a green bond in Hong Kong in 2015. No further green bonds have been issued in Hong Kong since then. 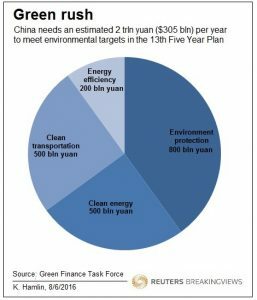 The Green Finance Task Force – an advisory group lead by the People’s Bank of China – says an estimated annual 2 trillion yuan ($305 billion) needs to be ploughed into green projects to meet the government’s environmental targets. The bank says as much as 85 percent of this must come from the private sector.